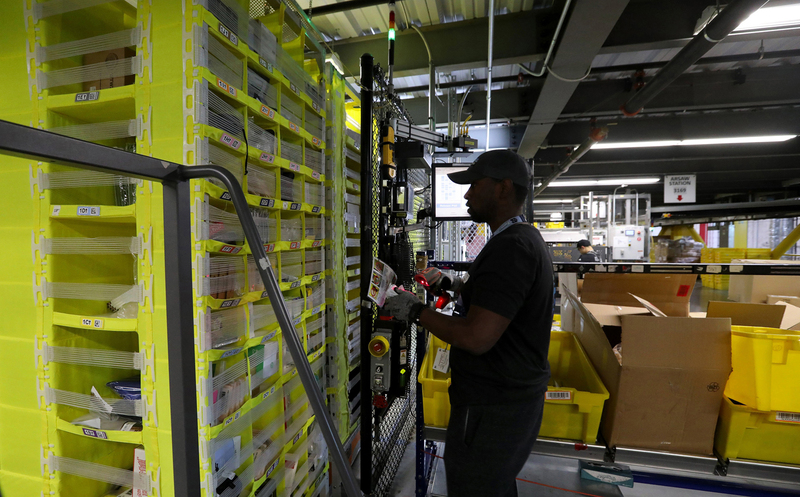 An Amazon worker scans items with a handheld device before putting them in storage pods maneuvered by robots. Amazon announced its plan to roll out a $15-an-hour minimum wage for all of its U.S. employees. After years of forcing its employees to labor under horrible working conditions, paying them such low wages that they have to rely on food stamps and avoiding federal taxes, Amazon has finally made one good decision for its workers. But it’s not much beyond good PR. Amazon recently announced an increase in the minimum wage for its hourly workers in the United States and United Kingdom to $15 an hour. In conjunction with this action, however, the company plans to terminate monthly bonuses for warehouse and customer service workers. This wage increase — precipitated by strikes in July, #FightFor15 protests and Bernie Sanders’ Stop BEZOS Act — may seem like an act of generosity, but it’s merely a capitulation to pressure. Until Amazon enables unionization efforts, increases benefits to independent contractors and veteran workers and stops avoiding taxes, it shouldn’t receive any kudos. Amazon will remove Restricted Stock Unit awards, which give full-time warehouse employees two or three company shares annually, as well as monthly bonuses known as Variable Compensation Pay. RSUs give workers shares worth almost $2,000 each. VCP gives the average worker $1,800 to $3,000 more a year. ”The significant increase in hourly cash wages more than compensates for the phase out of incentive pay and RSUs,” Amazon’s spokesperson said in a press statement. But its workers disagree. Those earning close to $15 an hour before the raise said they could lose thousands of dollars because of the changes. On top of this, although Amazon claims to increase the wages of hourly workers earning more than $15 an hour, Bloomberg states the hourly raise will only be $1 for them. These workers who have given years of their time and effort to Amazon will obtain minimal gains from a company that supposedly cares about them. Veteran workers in particular will be affected by the changes. They should receive a greater raise than the one Amazon is offering — especially considering that their stock option awards and monthly bonuses will be removed. A $1 increase does not give their service the compensation that they deserve. Additionally, independent contractors employed by Amazon will not earn any increase whatsoever. Drivers, who sometimes earn less than the minimum wage in the city where they live, do not receive overtime pay, covered vehicle expenses, workers’ compensation or unemployment insurance because they are not classified as employees. Currently, the workplace is ruled with an iron fist. An undercover journalist investigated the conditions at an Amazon warehouse and found that workers incurred points for disciplinary infractions — and incurring six points was grounds for job termination. Management monitored workers’ time and movements with handheld devices that sent messages if productivity went below a certain point. Workers can incur points for “time off-task,” which includes anything from getting a drink, talking to coworkers or taking too long to get a package. In certain warehouses, they must wait in line to go through a metal detector. If they accidentally bring something with them, they have to return the items to their lockers and are made to wait again behind tens of people. If Amazon had an honest desire to improve the safety, conditions and hours of its workers, it would allow them to unionize freely. In reality, Amazon actively fights against unionization efforts. It hires experts specialized in “union avoidance” and posts job advertisements for managerial positions that require experience with the supposed skill. It successfully pressured what might have been members of the first American union for the company to vote against such a proposal. Recently, an anonymous source leaked an Amazon anti-union training video. It suggested that workers should come to their bosses for any grievances rather than looking for a union to represent them. However, numerous warehouse workers have confessed that they faced further difficulties and even termination due to voicing their concerns to their employers. The video also advises managers to watch for warning signs of “associate disengagement, vulnerability to organizing, or early organizing activity,” such as the use of the word “living wage,” distribution of petitions and flyers, workers “who normally aren’t connected to each other suddenly hanging out together” and increased negativity in the workplace. It seems to suggest that bosses should maintain dictatorial control over their employees to prevent unionization from even arising as a topic of conversation. Bezos is now the richest person in the world with a net worth of $156 billion. He can afford to pay his workers more without cutting their bonuses and awards. His company will still earn massive profits regardless of incremental benefits that they give to their workers. Amazon succumbed to pressure, and real change happened. Let’s keep pushing.